Beauty Care Choices: Jane Iredale "Forever Pink Just Kissed"
One of Jane Iredale's top 10 products was included in a New York Times Style section story titled "Steps to Beauty That Fit Her Just Fine". Gorgeous actress, Anna Kendrick, shared her beauty routine and included her make-up essentials. Her lips: "I'm not big on lip color, but I like to have a little bit of something. 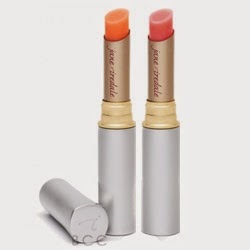 I just ordered Jane Iredale Just Kissed Lip and Cheek Stain. It doesn't just give you that bee-stung thing for two seconds; it lasts for hours". You can order yours in Forever Pink or Forever Peach. This is a fantastic product. Easy to put on and a nice natural color for the lips!